These titles have been out of use since we stopped hanging witches. 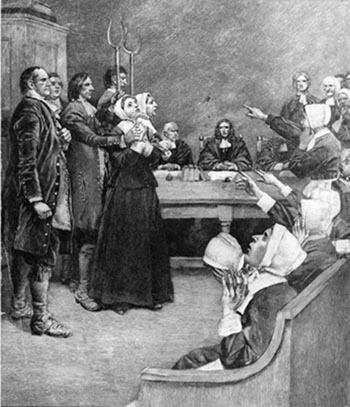 If you’ve ever read The Crucible or other books based in Puritan America, you’ve probably come across the term Goodwife and its abbreviation Goody and have perhaps seen the term Goodman. Obviously these terms came with the colonists from England but seem to have been used mostly by the Puritans in New England. To an extent the term denoted church membership, as those who belonged to the church were “good.” They seem to have been titles denoting a slightly lesser social status than those addressed Master and Mistress, but still with some social standing in the community. The term fell out of use in the early 1700s. Early forms of address for people of the middle and upper (but not noble) classes, precursors to Mister and Mrs. Mistress was used for both married and unmarried women. They fell out of use sometime in the 1700s as the democratization of language preferred Mister and Mrs. (which is still short for Mistress, but obviously pronounced Missus) or Miss for all people. For a while, Mrs. was used as term of respect for women even if they weren’t married- such as calling the cook and housekeeper Mrs. Lastname to denote their rank even if they weren’t married. Miss also was derived from Mistress. An interesting historical fact about the use of the word Miss was that in a family, the eldest daughter would have use of the title Miss LastName and her younger sisters would be called Miss FirstName until the eldest married and the next was bumped up. The use of the term Master for the minor, male children of a house survived well into the 20th century. During the period immediately following the Revolution, Americans were trying to figure out what they would call each other. Many advocated for a no-frills approach and an ending of most earlier courtesy titles. One wish was to change female titles to eliminate a distinction between married and unmarried women. For those who think the term Ms. originated in the 20th century, it has actually existed as the abbreviation for Mistress as long as Mrs. and Miss have been around. France has gotten rid of Mademoiselle, and I’d really like to see the US do the same. No Ms or Mrs., but just Ms. I had not heard that! That’s really cool and definitely something Americans should consider. I wonder how well people have adapted to it in casual conversation?